Originally from Endicott, NY, Michael attributes his love for cooking to his childhood Sunday family dinners at his grandparents’ house. After high school Michael attended Connecticut Culinary Institute where he earned a degree in Advanced Culinary Arts. After returning to New York he quickly ascended to the top ranks of the kitchen. He then moved to New Jersey where he worked as a Sous Chef and Executive Chef at top restaurants, hotels and universities including The Pluckemin Inn, The W Hotel Hoboken and Farleigh Dickinson University. 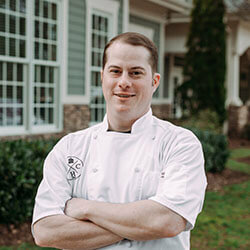 In 2017 He relocated to North Carolina where he assumed the Sous Chef role at Carolina Country Club. Michael’s passion is seen through his use of fresh seasonal ingredients that he lets “speak for themselves”. In his downtime you will find him at a golf course or at home cooking and experimenting.